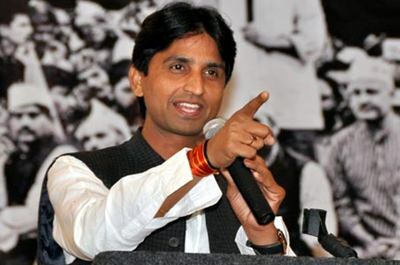 NEW DELHI: In remarks that can stoke political controversy, AAP’ s Amethi candidate Kumar Vishwas has said that given a choice between the Congress and BJP, he would prefer the latter. He also praised RSS for its discipline and even said that branding the Sangh as communal was the work of ‘dissatisfied’ Congressmen. The AAP leader, who is facing a tough electoral battle against Congress’ Rahul Gandhi and BJP’s Smriti Irani, was responding to a question on AAP being accused of being “urban naxals”. “Referring to us as ‘urban naxals’ is like calling the Sangh communal. It is the work of dissatisfied Congressmen,” he said. In an interview to ABP news, Kumar Vishwas said if it came to choosing between Congress and BJP, he would prefer the latter. He said he had voted for the BJP five years ago years ago and praised RSS for its discipline. He even said India’s first Prime Minister Jawaharlal Nehru had recognized Sangh’s patriotism by inviting them to participate in the Republic Day parade after the war with China, and Sangh volunteers were recruited for manning traffic in Delhi during the 1965 war. The party sought to distance itself from Kumar Vishwas’s statement and offered no comment.